It's my privilege to present you with a horror tale featuring the astoundingly talented Angelo Torres! 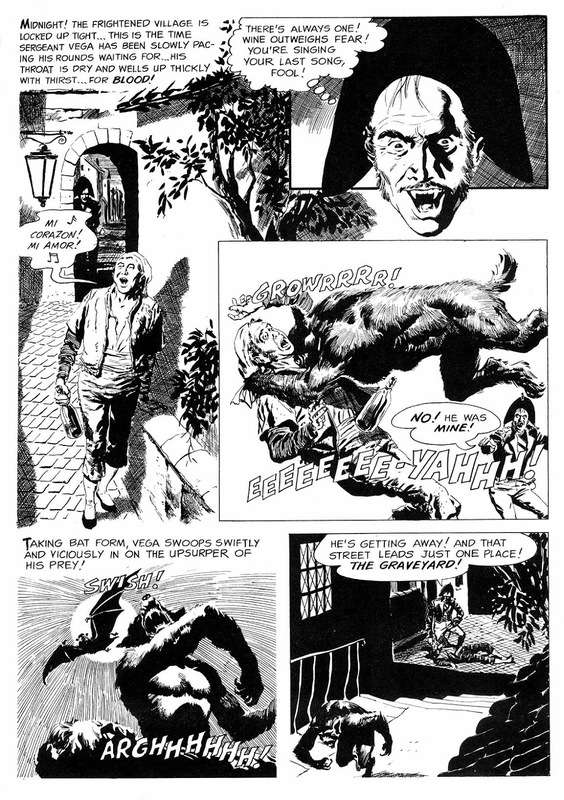 In a little Spanish village there appears to be a monster on the prowl killing people! Alright, Skully! What do you think happens when a village is attacked by not just one, but two different monsters? 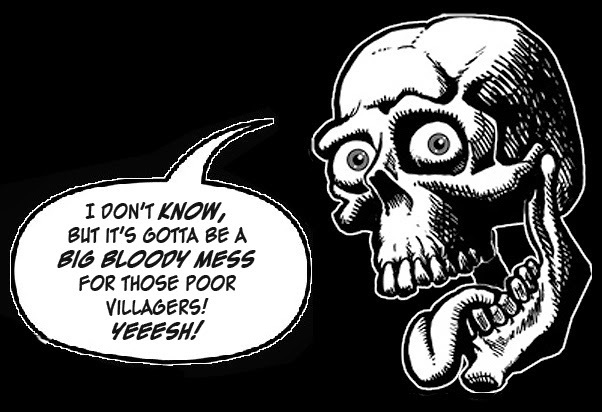 You are right about that, Skully! 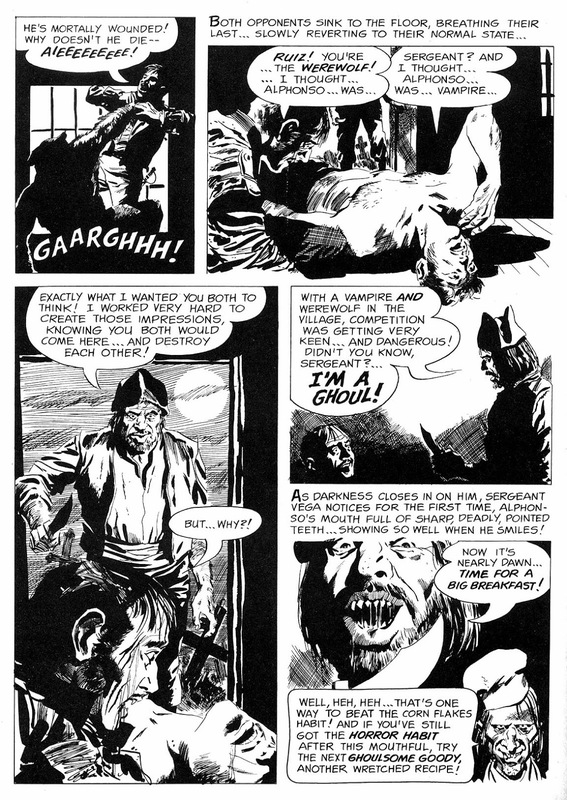 This story originally appeared in CREEPY #7, in 1966, and it was written by Archie Goodwin. 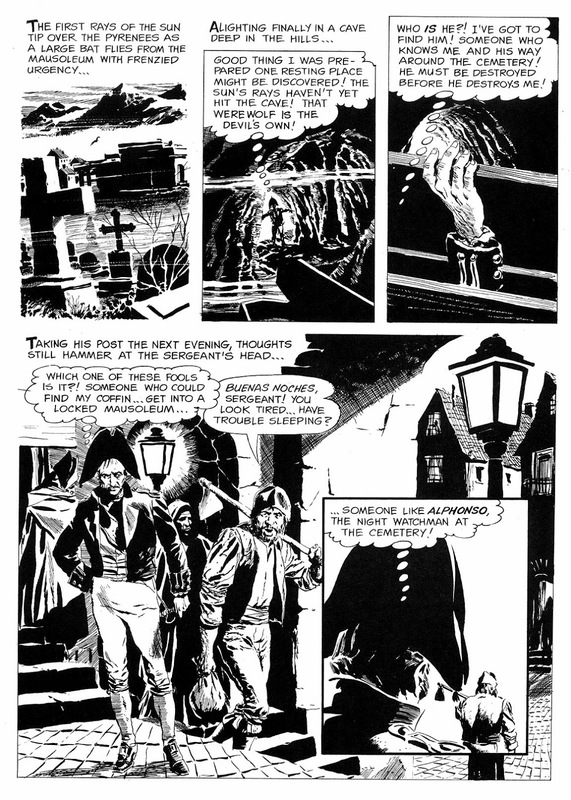 "The Fleagle Gang" was a group of friends that consisted of artists Al Williamson, Frank Frazetta, Angelo Torres, Roy Krenkel, George Woodbridge, and writer Nick Meglin. They began to make there respective marks essentially at the start of the 1950's. 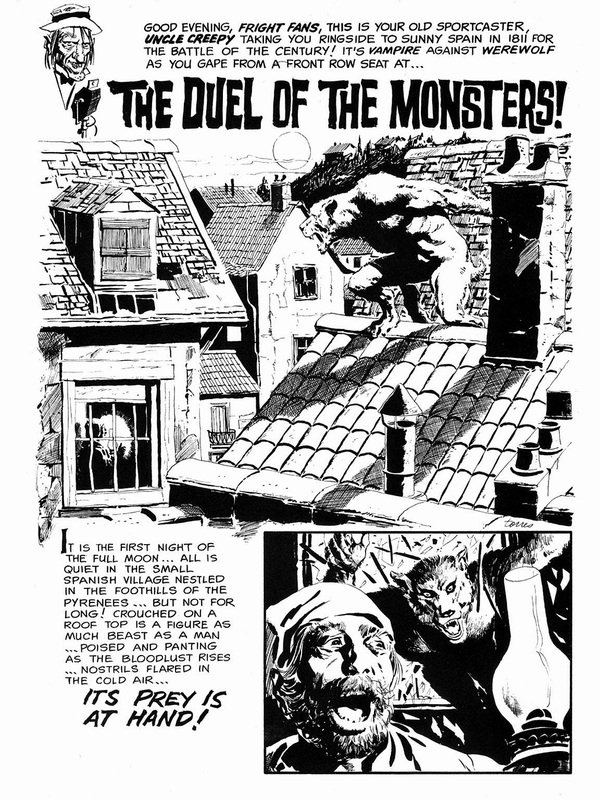 When Williamson was doing work for EC Comics early in his career, often his "Fleagle" buddies Torres, Frazetta, and Krenkel would help out with the artwork, producing astonishing results. 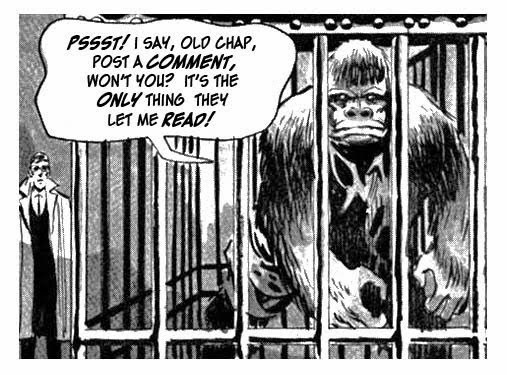 Torres also began working for EC, usually inking over Williamson's pencils. 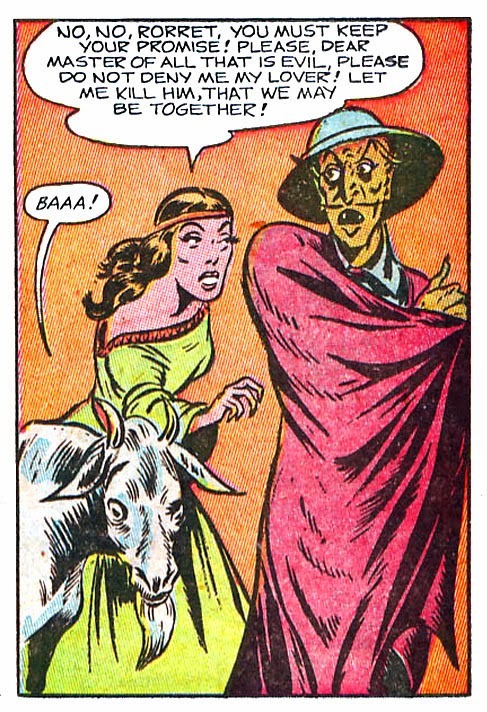 In 1955 Torres began doing solo work for Atlas/Marvel Comics, producing stories for their science fiction, suspense, western, and war titles. 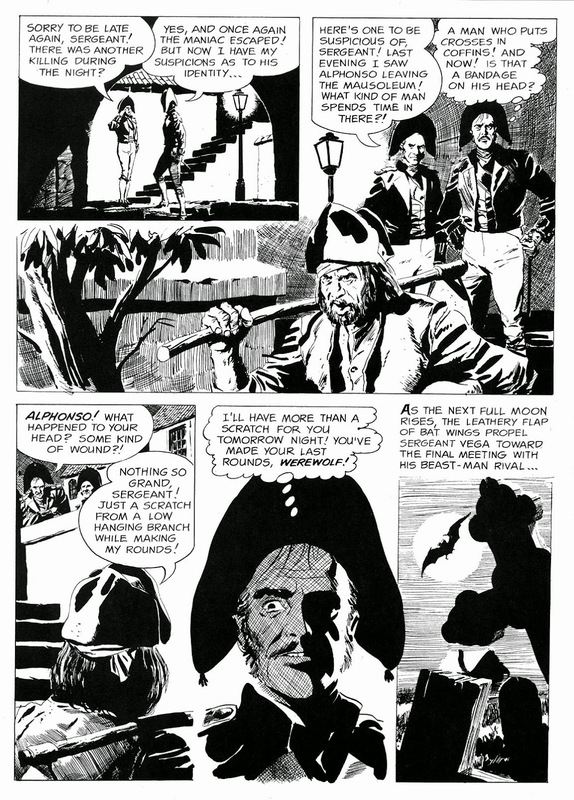 Torres was soon drawing for Charlton and Harvey Comics, and also doing historical stories for Gilberton's THE WORLD AROUND US and CLASSIC'S ILLUSTRATED titles. 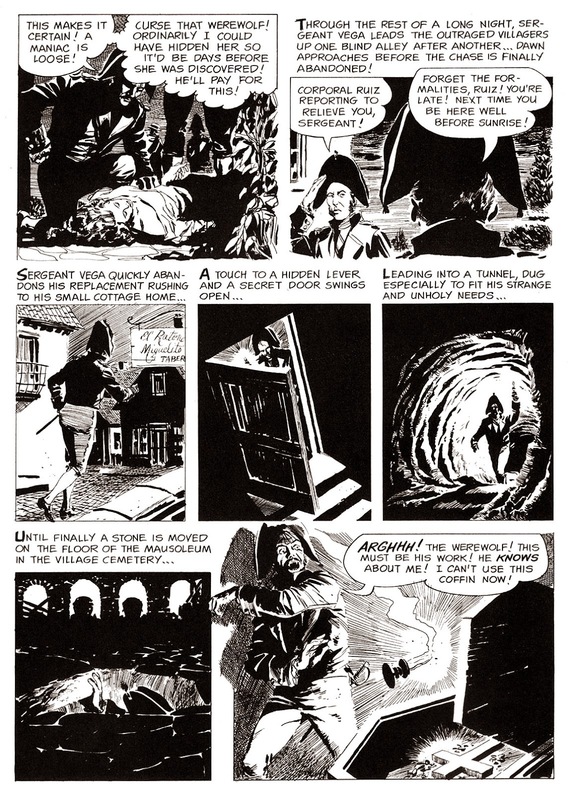 When Warren Publishing began it's black and white magazine line in 1964, Angelo Torres was a natural fit, and starting with CREEPY #1 Torres was featured prominently in many of Warren's magazines over the next few years. 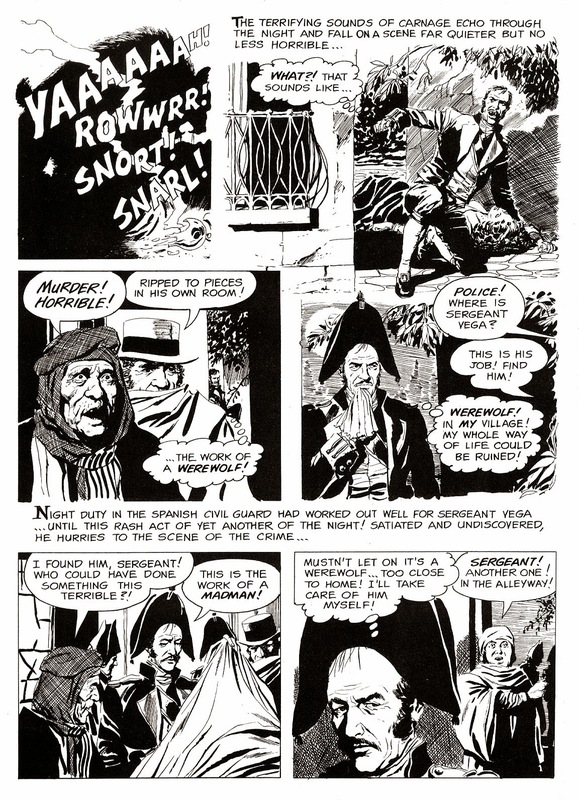 In 1970 Torres returned to EC, becoming one of MAD magazines most popular satirical artists, with Torres transforming his realistic rendering for a more Mort Drucker-ish cartoon style. Throughout the 70's Drucker and Torres anchored MAD's issues with amazing spot-on TV and movie parodies, portraying celebrities and stars with their incredible humorous and accurate depictions. 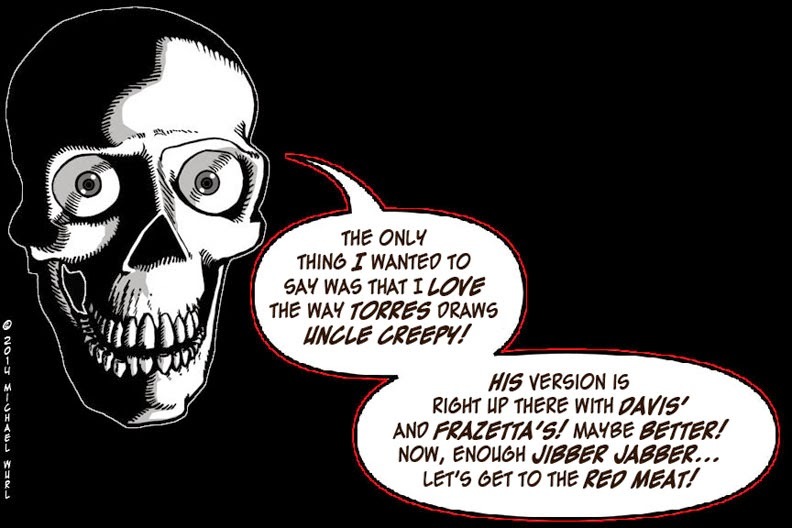 Torres art continued appearing throughout the pages of MAD into the new millennium. Regarding our featured story today, Torres exhibits his masterful abilities to create artistic realities in the palette of chiaroscuroesque imagery. One monster? That's pretty bad. That's enough to make you soil your garments. Twice. Skully, you had something else to add? "THE DUEL OF THE MONSTERS!" 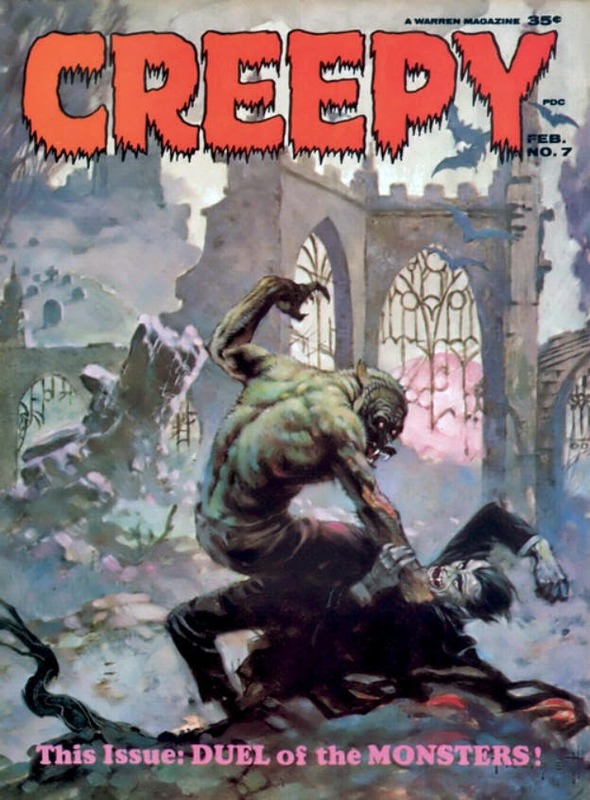 Here's the awesome Frank Frazetta cover that goes with this story! 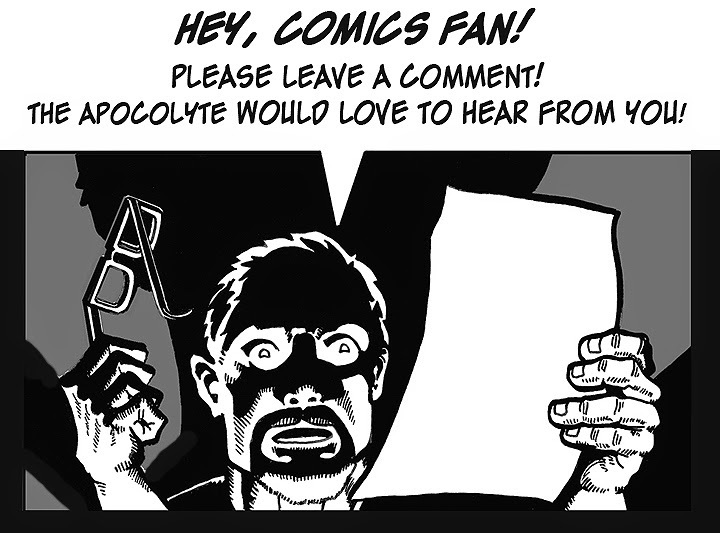 Click the image to go see it! 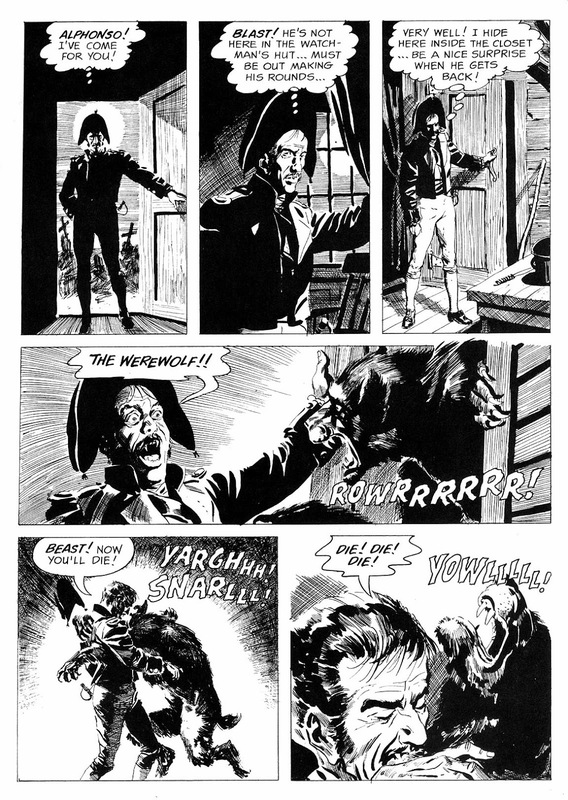 will return with more fantastic black and white comic artwork!